It takes its time to make its point, but the first number one album of the nineties finally tells us in no uncertain terms that things are not going to be as they were in the eighties. Initially one listens to “Man Don’t Cry,” which could be about a soldier’s wife but which I interpret as being about Mandela, and it sounds like a pleasing enough hangover from the previous decade; still these songs and the protests accumulated and one has to remember that this album made number one about a fortnight before Mandela’s release. Hard as it is to imagine now, the beginning of the nineties, so soon after the fall of the Berlin Wall, appeared to be one of those rare moments when humanity got waylaid by an epidemic of common sense. Still, one notes the presence on this record of sundry eighties TPL reliables – Palladino, Katché, Ditcham – and wonders whether this is going to be anything more than residual reasonable eighties pop. Given how long it took the first Christians album to sink in, however, it is hardly surprising that the listener has to work with the second one, become accustomed to it before he or she gets wrongfooted. Hence “I Found Out,” which begins with the uncompromising line “I know that the earth is rotten” (the adjective “rotten” pops up several times throughout Colour, as though an ember of punk remembrance still burned), suggests a slowly unravelling but gigantic picture of redemption. The voices become a little too insistent, a touch too uncomfortable, for plain yea-saying, and the rhythms and arrangement turn steadily more forceful and less avoidable. A lot of this has to do with the lead voice of Garry Christian, which provides some of the clearest and most precise diction I have heard from a British pop singer since Al Bowlly; frequently he sounds like a voice from the thirties and forties transported into the ruins of the present. And there is a very telling arch in his lower register – part Larry Graham, part Elmer Gantry of Stretch, part foreseeing Ashley Slater’s work with Norman Cook – as if he is crouching down to you for an intimate chat. This is in large part why a straight love song like “Greenbank Drive” works; that as well as the knowledge that really the song isn’t that straight, that the singer’s sense of lightness of air and rebirth can be said to stand for a greater liberation that has been gained. Certainly the anti-politician/tycoon slow burn of “All Talk” is far less ambiguous and far more forthright in its message and attack than some other big acts of the period I could mention; this is certainly not a song of the South, could not even have come from Manchester, could only have emanated from Liverpool. How can you do a song called “One More Baby In Black” – a hypnotic and powerful song which starts out as an “In The Ghetto”-type examination of youth drug addiction and ends up as a militant call to revolution – with its title’s none-too-subtle Beatles reference and not come from Liverpool? However, we are constantly reminded that the Christians are a vocal harmony group, and a family group at that, whose history stretches back to before punk; consider the multiple call-and-response routines on “Community Of Spirit,” a virulently bitter condemnation of neoliberal Conservatism which ends on the chilling couplet: “I sit here and watch you bleed to death/For what you’ve done to me and mine.” Sadly, in the twenty-five years after this recording, it still sounds painfully contemporary. Note also that near the end of this song, the beats temporarily fold back on themselves – this is one of the vital aural rhetorical tricks of producer Laurie Latham. Given the presence of Pino Palladino, and the sleeve’s acknowledgement to “the Kewleys,” it is not unreasonable to think of Colour as a cold rationalist remix of No Parlez. Even the break-up song “There You Go Again” provokes me to question whether it really is about a serially cheating lover or whether it’s actually addressed to Thatcher (“It doesn’t matter what you say/I’ve taken all I can”). Finally a salvation of sorts is found in the closing “In My Hour Of Need,” a hymn to her, a prayer in praise of light amidst the remorseless shovelling of topsoil darkness (with some psychedelic backwards guitar and ambient gambits at its end to remind us that escape isn’t always easy). 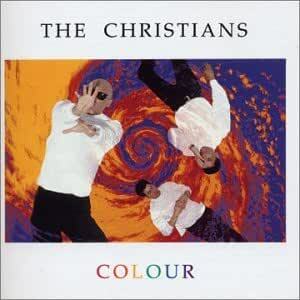 But it does seem to me that the album’s centrepiece – it is literally right in the middle of the record – is “Words,” the best thing The Christians ever recorded. Such an elegantly patient and wracked performance – Garry’s vocal takes a long time to come in, as though awaiting his final judgement. In it he sings, controlled but palpably in pain, about the damage done and how he’s sorry and how he loves her, but how, how can he possibly describe this in words? One obvious comparison point is Dexy’s’ “This Is What She’s Like,” but its roots go much deeper, back to eighteenth-century Ireland, when Peadar Ó Doirnín composed the poem “Mná na hÉireann” (“Women Of Ireland”). The poem personifies Ireland as a woman, constantly at the beck and call of her English master, and crossly wonders why other Irish people don’t defend her. This was set to music earlier in the twentieth century by Seán Ó Riada, a noted Irish composer and authority on traditional Irish music who in the sixties collaborated regularly with the group which would eventually become The Chieftains. They recorded an instrumental setting of Ó Riada’s adaptation in 1973 which Kubrick used for the film Barry Lyndon. Subsequently covered by many performers, ranging from Mike Oldfield to Kate Bush, “Words” is a free adaptation of Ó Riada’s melody with new lyrics by Henry Priestman. You could view it as a simple song of love, penance and inadequacy, but Garry’s performance is too intense for it to be merely that. It is if he is singing it in the persona of Britain, apologising to Ireland and trying to make or find peace. For make no mistake, beneath its bright and opulent-sounding surface, Colour is an extremely angry record which essentially demands sweeping change. It’s hard to listen to it in retrospect and not think that the poll tax riots are only about two months away, that dominoes will continue to tumble throughout 1990. It is probably more apt to think of it as a Liverpool Steeltown rather than the North West’s riposte to The Road To Hell. Things in this coming decade are not going to be particularly easy or comfortable. Next: a woman who would deafen Baile an Mhaoir and the plain of Tyrone.